An overview of St John Vianneys Curriculum and other Programs, Excursions and Activities which complement our Curriculum can be found on this page. 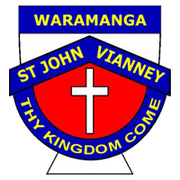 St John Vianney’s Primary School provides high quality programs aligned with the Australian Curriculum. This means that teachers in Catholic schools follow the same curriculum as teachers in State and Independent schools. Catholic schools additionally have Religious Education in the Catholic Faith as a Key Learning Area. Catholic teaching and values also permeate the whole of the curriculum. Our comprehensive curriculum assists children to develop fully the skills and talents necessary as life-long learners. Through teaching and learning activities children are encouraged to think about themselves, their learning and how they interact with others. St John Vianney's have a Learning Support Program in place to support and encourage any students in the school who, for a variety of reasons, require extra assistance or extension. Flexible approaches are taken to address the individual student's needs. St John Vianney's this year is developing whole school practices around Science Technology Engineering and Maths (STEM), this includes use of the CSIRO Scientists in Schools Program and a partnership with Questacon. We have embraced our BYOD Program (Yr 5&6) and Coding is being taught in Technology classes. This year has also seen the development of Positive School Wide Behaviour Program which has been tailored specifically for St John Vianney's and in particular our students. 2017 is the beginning of an exciting time at SJV seeing cutting edge education balanced with well being which will prepare our students for a bright future. Learning at St John Vianney’s continually moves across curriculum boundaries. When students focus on a particular topic, they may well discuss, interview, read, write, study graphs, measure or make models; they may inquire, test ideas, calculate, paint, sing or do any number of activities that defy narrow classification and cannot be restricted to one curriculum area. Teachers use integration to describe their commitment to this principle of ‘bringing things together’ and keeping learning whole. They value it, plan for it to happen and strive to make it work. Curriculum integration reflects the ‘seamless’ nature of knowledge. Its primary purpose is to enhance and maximise learning both within and across the Key Learning Areas. It does not abandon the skills and understandings that are specific to individual disciplines but is a means of enriching those areas that cross the curriculum. please contact your childs teacher or the SJV Front Office.